I’m going to admit to y’all that I did not know you did anything with a brisket besides smoke it until I moved to Austin in 1999. I also didn’t know you could buy one that weighed less than 7 lbs. Where I grew up, brisket = bbq, and that was that. It took me a long time to come around, but I started coming across recipes for braised or roasted brisket more and more, and finally, this weekend, I bit the bullet and tried it. And you know what? It was still tender and juicy and delicious, albeit with an unusual herb rub giving it quite a different flavor than the smoked brisket I’m used to. I’m recommending a few changes from the original recipe, such as cooking it directly in the roasting pan instead of on a rack (I think it’ll be even juicier this way) and throwing in some mushrooms and carrots that can cook in the juices, like a pot roast. Also, I’m adding crockpot directions for weeknight cooking (and for Hilary, who doesn’t turn on the oven if it’s more than 45 degrees out). Don’t be afraid of the mint — it’s very subtle. 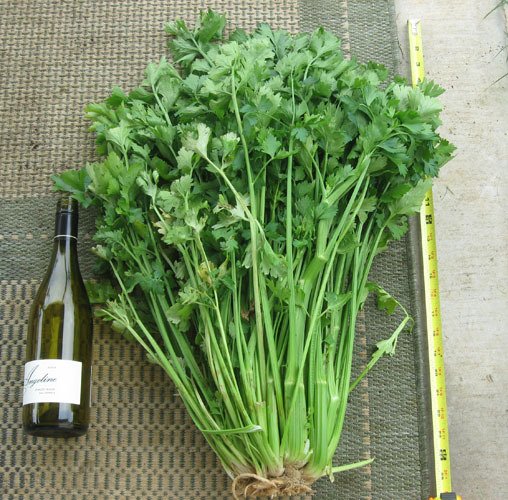 I love the generous amount of herbs used here, because a) they are tasty, and b) I often have a hard time using up all the herbs we get before they go bad, and this is a good way to do so. Preheat oven to 350°F and spray a roasting pan with cooking spray. Season brisket all over with salt and pepper and then place in the roasting pan; roast for 1 hour. Meanwhile, put parsley, mint, thyme, vinegar, pepper flakes, garlic, onion, salt and pepper into a food processor and pulse to make a thick paste; set aside. After 1 hour, remove brisket from oven; reduce oven temperature to 325°F. Carefully add broth to pan, spread herb paste over brisket, arrange mushrooms and carrots around brisket, cover pan with foil and continue roasting, basting every 45 minutes or so, until very tender, about 2.5-3 hours more. Transfer brisket to a platter; set aside to let rest for 10 minutes. Skim off and discard any fat from liquid in pan. Trim brisket further, if desired, then thinly slice against the grain (here’s how to do that) and spoon pan sauce over the top. Reduce amount of chicken broth to 1 cup. Spray a crock pot with cooking spray or line with a crock pot liner. Season brisket all over with salt and pepper and then place in the crock pot. 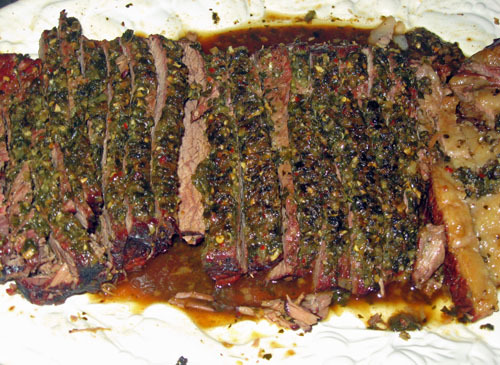 Put parsley, mint, thyme, vinegar, pepper flakes, garlic, onion, salt and pepper into a food processor and pulse to make a thick paste; spread over brisket. Add broth to crock pot, spread herb paste over brisket, and arrange mushrooms and carrots around brisket. Cover and cook on low for 10 hours. Transfer brisket to a platter; set aside to let rest for 10 minutes. If you want to use the juices as gravy, put them in a saucepan and cook on medium-high heat about 10 minutes, until they reduce a bit and aren’t so watery. Skim off and discard any fat from liquid in pan. Trim brisket further, if desired, then thinly slice against the grain and spoon pan sauce over the top. The garden is finally finished! I have three veggie/fruit/herb beds, and in the back corner I planted a silver sage, pineapple sage, and some bulbs to add color (and hopefully attract some butterflies). 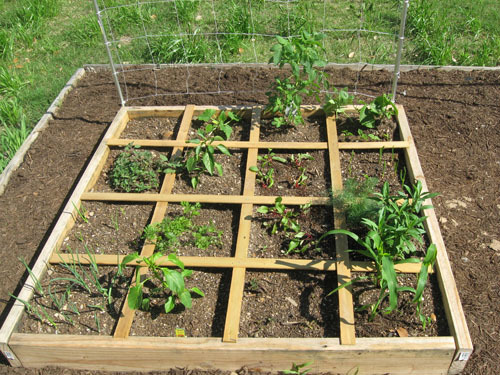 Mason and I built the 4×4 boxes, and I put together the trellises in my living room. They are made of steel electrical conduit pipe, nylon trellis netting, and rebar (you drive the rebar pieces in the ground and slide the frames over them). Every year, around the beginning of July, my tomatoes defeat those puny tomato cages and fall to the ground, so this year I was looking for something that could hold its own against them. It’s worth the small effort it took to build these just to see the looks on the male Home Depot employees’ faces when I, a girl, asked for 2×6’s, electrical conduit pipe and rebar, and then had them cut down my boards and pipe. Ladies, you should try it some time. The grids are made of wood lath nailed together with some small nails. 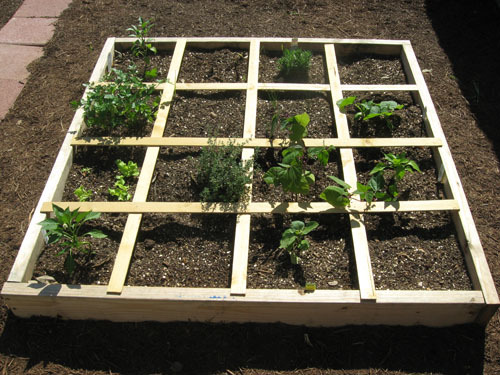 These make it easy to divide the box into the squares you plant in. Here is Box 1, which contains summer squash, a green striped heirloom tomato, pole beans, oregano, bell pepper, chard, garlic, yellow onions, carrots, beets, dill, tarragon, red onions, giant Marconi sweet peppers, potatoes, and two kinds of corn. Bed two contains yellow plum tomatoes, cucumber, Celebrity tomatoes, Black Krum (heirloom) tomatoes, basil, strawberries, zucchini, and spinach. Bed three contains Cubanelle peppers, banana peppers, jalapenos, asparagus, leaf lettuce, parsley, thyme, lavender, chives, acorn squash (not sure what I was thinking; I’m going to need another trellis for these), purple bush beans, and eggplant. 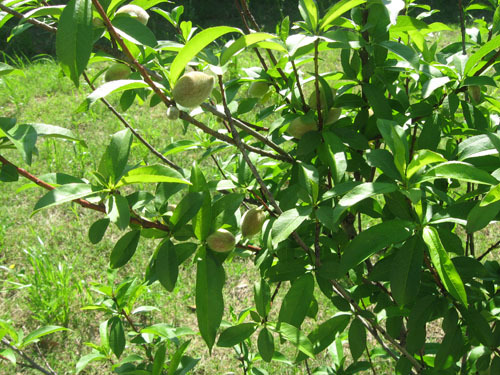 Oh, and my peach tree has baby peaches on it! The tree is two years old and this is the first year we’ve seen actual fruit. How cute are these? 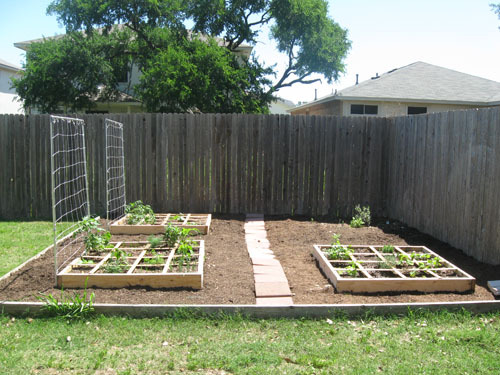 Anyway, I designed the garden before I knew I was going to be blogging for Greenling and getting a free box of produce each week. So I’m probably going to be up to my ears in produce this summer. But that’s never a bad thing, right? Plus, about 75% of the fun for me with gardening is the process, so it’s all good. Anyone else have a garden this year? What are you growing? Anyone else get the Whole Foods e-newsletter? 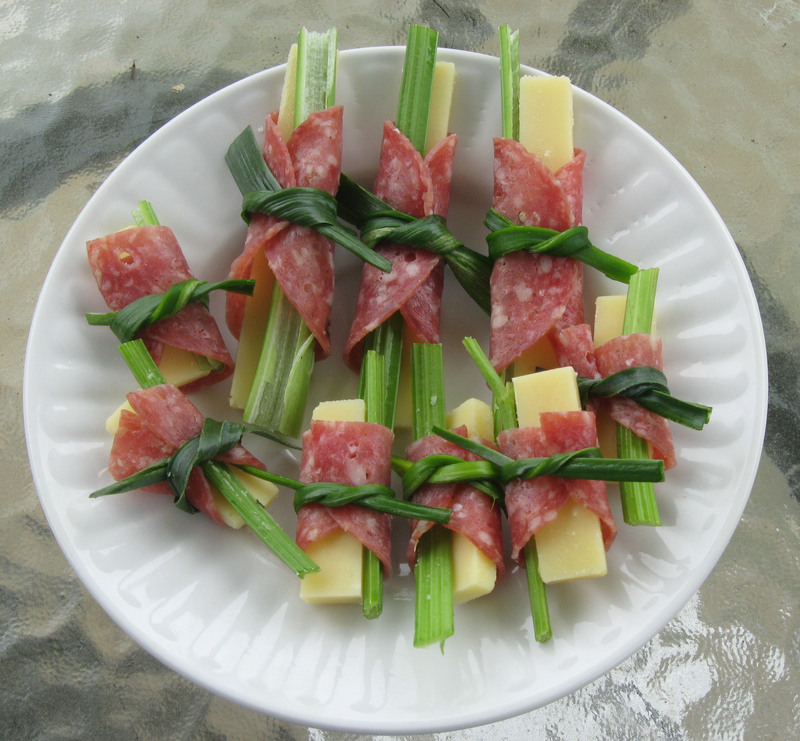 It is always full of great recipes and is how I came across this intriguing dish. It’s a vegan main course, stuffed with quinoa and chickpeas for protein, and mushroom and peas as the main veggie content. As I made it, I imagined that this would be something you could find on the menu in a restaurant in The Haight with this song playing in the background. 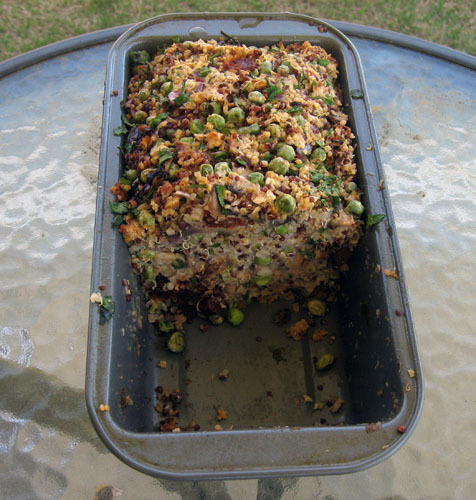 Anyway, the chickpeas and rolled oats serve as the binders in this loaf, replacing the breadcrumbs and eggs you usually find in meatloaf-like recipes. The original calls for frozen peas, but I got some fresh ones this week and am using them here. Because of that, I recommend blanching them for a few minutes in boiling water before adding them to the mix (frozen peas are already blanched). The Whole Foods site recommends serving leftovers sliced on toasted bread, like a veggie burger. I think that’s going be my lunch tomorrow. Preheat oven to 350°F. Lightly grease an 8-inch loaf pan with oil; set aside. Bring a large saucepan filled with water to boil. Add peas and cook 3 minutes, then remove with a slotted spoon and set aside. (If using frozen peas, you can skip this step.) Heat oil in a large skillet over medium-high heat. Add mushrooms, salt and pepper and cook, stirring occasionally, until mushrooms are golden brown, 6 to 8 minutes. Meanwhile, put beans, oats and 1/2 cup water into a food processor and pulse until almost smooth. In a large bowl, combine mushrooms, bean mixture, quinoa, peas, parsley, tomatoes, onion, salt and pepper. Transfer mixture to prepared loaf pan, gently pressing down and mounding it in the middle. Bake until firm and golden brown, 1 to 1 1/4 hours. Set aside to let rest for 10 minutes before slicing and serving. 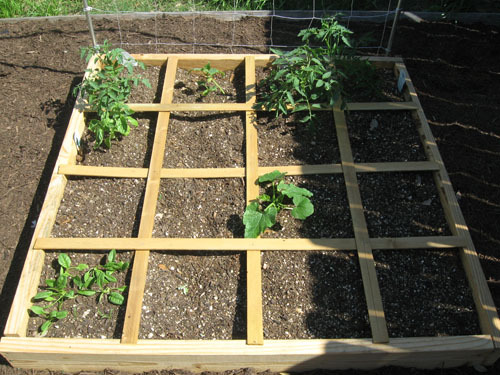 A few months back, Andria told me about a compost bin she’d built in her Citizen Gardener class using shipping pallets. I was intrigued. I’ve been wanting a compost bin for a while, but refused to pony up a lot of money for one. 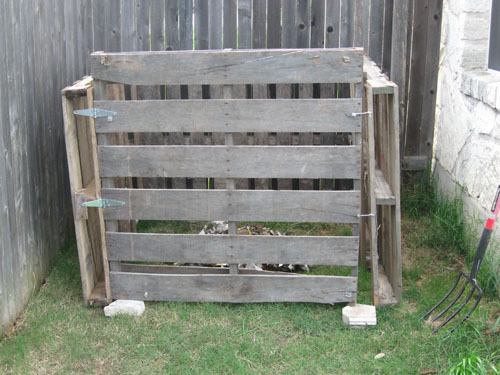 This project would be perfect for me, because a) I like construction, and b) I am cheap, and shipping pallets are free. You can get them at places like grocery stores (they usually just throw them away), but we happened to have new sod installed in March, so I asked my yard guy to leave me the pallets the grass came on. Most of them were broken beyond repair, but I salvaged four that I thought would be usable. I did some googling and found these instructions. I picked an out-of-the-way spot in my yard to build the bin (because, honestly, it’s a little ghetto), and voila! In about an hour, I put together a functional, albeit not very pretty, compost bin. 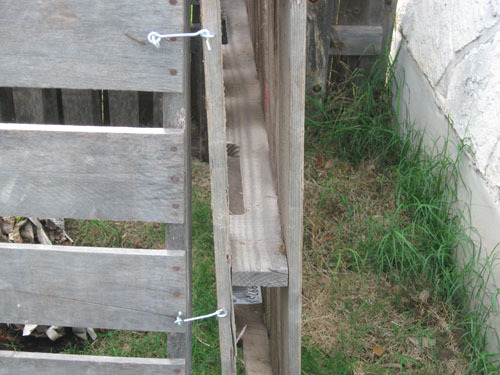 I followed the instructions on the page linked above pretty closely, and although the gate doesn’t swing out too easily (it’s heavier than the left pallet it’s attached to with hinges, so I keep it propped up on the stones you see above), it opens. This way I can easily access the pile to turn it. 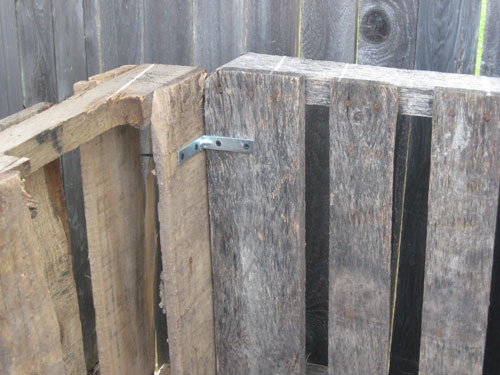 A corner bracket attaching two pallets in the back of the bin. The hook-and-eye latches that keep it closed and keep most critters out. Now I’m looking forward to free compost for my garden. That stuff is expensive, and I’m glad to be able to contain my own pile in my back yard. Hilary reminded me today that I haven’t talked much about Ryan lately here. So I’m going to tell you what happened this week when I pulled out a pint of strawberries and offered him one. He ate it quickly, then asked for more. He then ate another one. And another. And soon, in one sitting, he had eaten an entire pint of strawberries and then started crying when I told him that he’d eaten all the strawberries in the house. Yeah. If you remember, Ryan is not yet two. Now, yesterday I made chicken nuggets. I’d never even made them at home until last night, when I came across a recipe for chicken nuggets breaded with almond meal instead of breadcrumbs that sounded interesting. They tasted just like regular chicken nuggets, but did Ryan want them? Of course not. An entire pint of strawberries in one sitting? No problem. But a toddler finger-food staple? Just one bite? Well, that’s just ridiculous. And so on. It did not work. So tomorrow night, I’m going to serve this soup and hope for better results. If kiddie-style chicken’s not cutting it, we’ll just go with a more adult chicken dish and see what happens. There’s much to love about this soup. Inspired by several veggies I needed to use, it’s stuffed with vegetables, chickpeas, and chicken, and gets a wonderful smoky flavor from smoked paprika. It also comes together quickly on a weeknight. 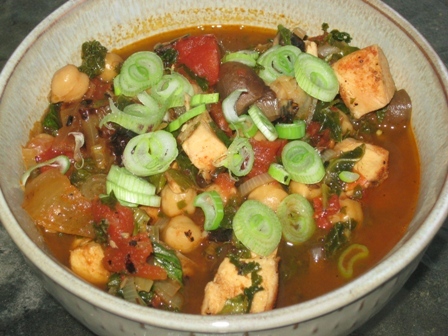 It would taste great without the chicken and with vegetable broth for a vegetarian version. Heat olive oil over medium-high heat in a Dutch oven. 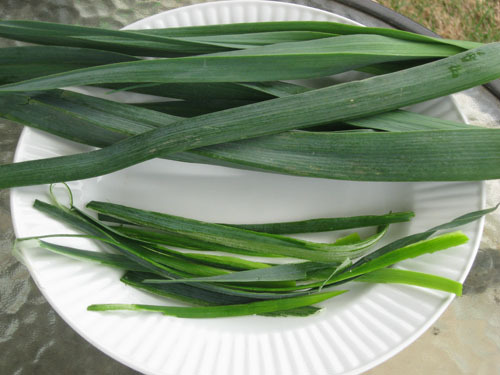 Add onions and garlic and cook about 5 minutes, until onions soften. Add remaining ingredients, seasoning with salt and pepper to taste, and bring to a boil. Reduce heat and simmer for 15 minutes, until greens or softened. 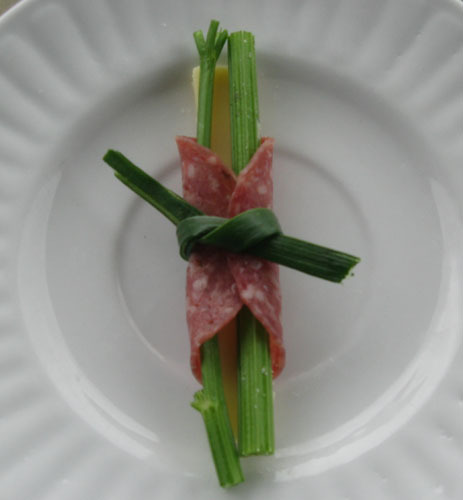 Garnish with chopped spring onion tops. 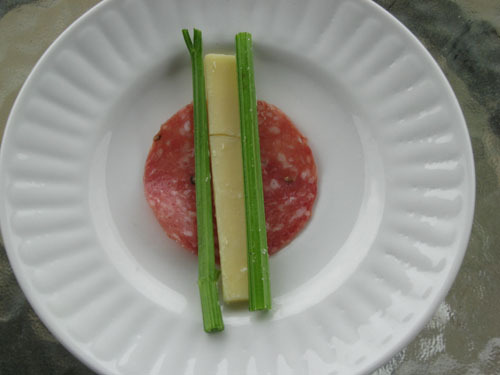 Serve with crusty bread to soak up the rich broth.